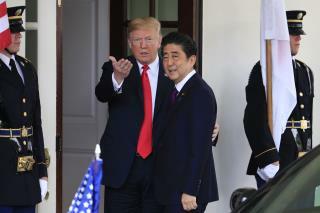 (Newser) – President Trump on Friday said that Japanese PM Shinzo Abe had nominated him for the Nobel Peace Prize, and had given him "the most beautiful copy" of the five-page document, but Japanese newspaper Asahi is reporting on Sunday that Abe did so only at the request of the US government. Abe was apparently approached about the nomination after Trump met with North Korea's Kim Jong Un last year, reports Reuters. That Abe.He's a funny guy. This was actually a mistake on Trump's part. He didn't realize that it's called the Nobel Peace Prize. What he thought he was demanding was the Noble PIECE Prize. Damn! I knew the Japanese talent for satire is extremely subtle. I just didn't know how subtle.